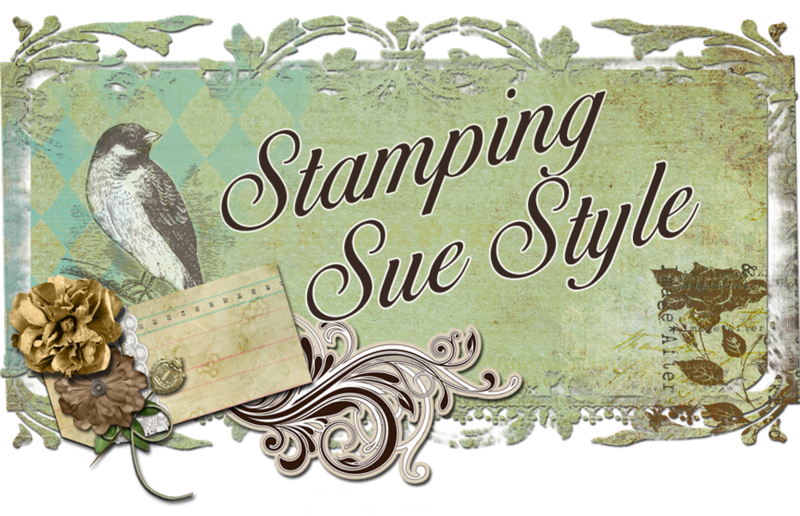 Stamping Sue Style: A home for Tim ! For this one we need you to create a vintage or shabby chic project with a man or boy in mind. Let's see those male themed creations come to life. Now this one had me scratching my head for a while, I didn't need any male birthday cards and as I like to make things that can be used I had to stare at the walls for some little time ! Then it was as if the answer was staring me in the face when I looked at my Tim Holtz stamps which were crammed in to a drawer. So it was time to give (some of) them a home. 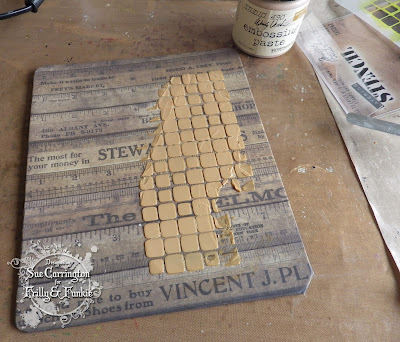 I started by cutting 2 pieces of mountboard just slightly larger than a set of stamps and covered them with Tim Holtz paper (apologies I don't know which collection this is from as they were loose in my stash!). I painted the 2 covers with Glue 'n' Seal and then used Wendy Vecchi's gold embossing paste through the Tim Holtz Tile stencil. The Glue 'n' Seal protects the paper from whatever liquid comes next ! Once the paste was dry I used my finger and 'smooshed' some gesso and black acrylic paint over the covers. The above is the back cover, I've used the stencil in a slightly different way as I'm not going to add embellishments to it. 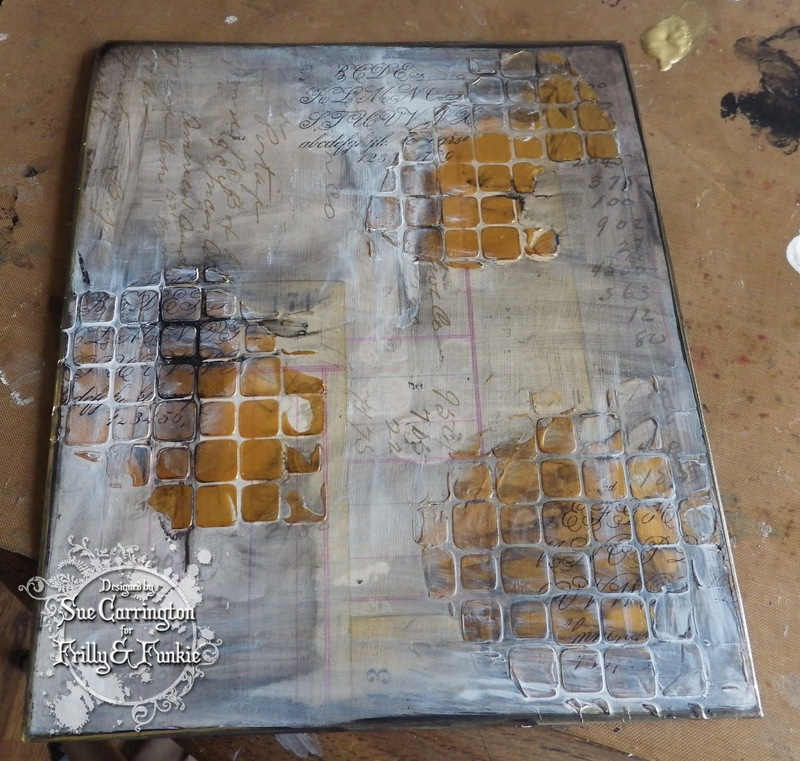 The beauty about adding Gesso or any white medium is that it blocks the colour below and allows any stamping to show up. 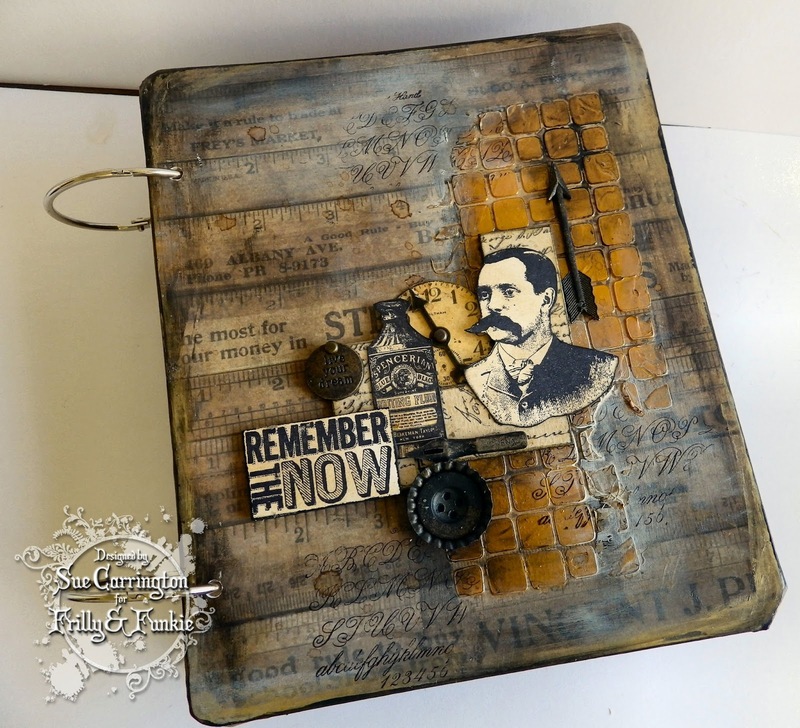 I've used the script stamp from the Tim Holtz Merchantile set and stamped without an acrylic block. The stamped images on the front cover are stamped onto white card that I've gently rubbed Tree Branch and Potting Soil Archival over. You can just about make out the script stamping on the above photo. The main text is stamped onto card then glued to a piece of mountboard to create a tile. Following a recent decluttering of my craft room I found some Tando domino pieces which came in rather handy. 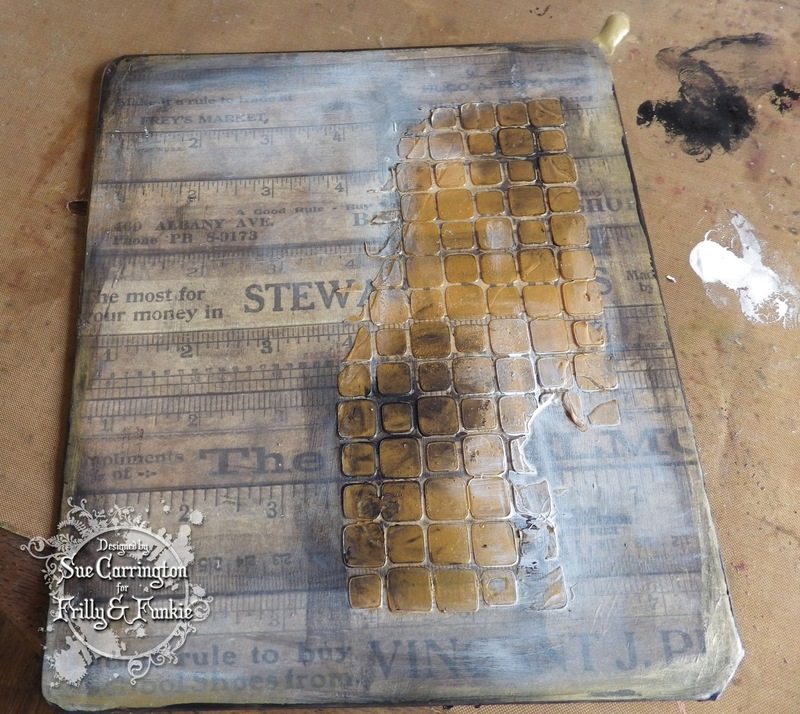 I stamped some Newspaper print paper using one of the stamps from the Tim Holtz Ledger Script stamps and covered 3 domino pieces. These formed a good base for the rest of the design. One last shot to show the finished back cover. The first ever Tim Holtz workshop I attended he introduced me to the idea of using white instead of black to create the shabby appearance that most of us love. I have to say it's one of my favourite things to do, so thank you Tim ! 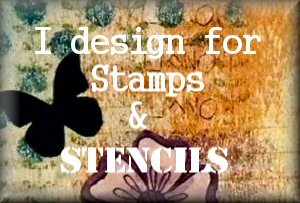 So there we have it, a home (if not for all of my stamps) for some of my Tim Holtz stamps. You never know I may even make some more ! Clever! I thought it was going to be an art journal but a stamp book is even better! 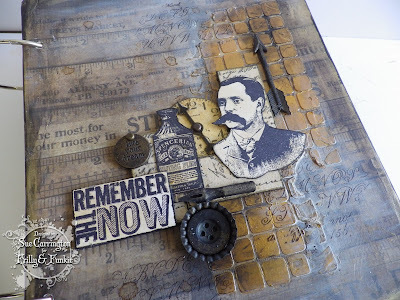 Beautiful embossing with magical layers of images and embellishments! Love this quite creative interpretation of the theme. Great job! Your title totally made me giggle Sue!!! Your 'home for Tim' is FABULOUS!! Your design totally "looks" like a time creation too so it's the perfect home! WONDERFUL creativity! XXj. Great idea, I need to maka some of these for some stamp,love your covers! Very masculine Sue and absolutely wonderful details/textures. Love the black and white mix of colour for that shabby appearance . This is such a genius creation! It has a look of old, weathered wood, and I just love the vintage vibe. 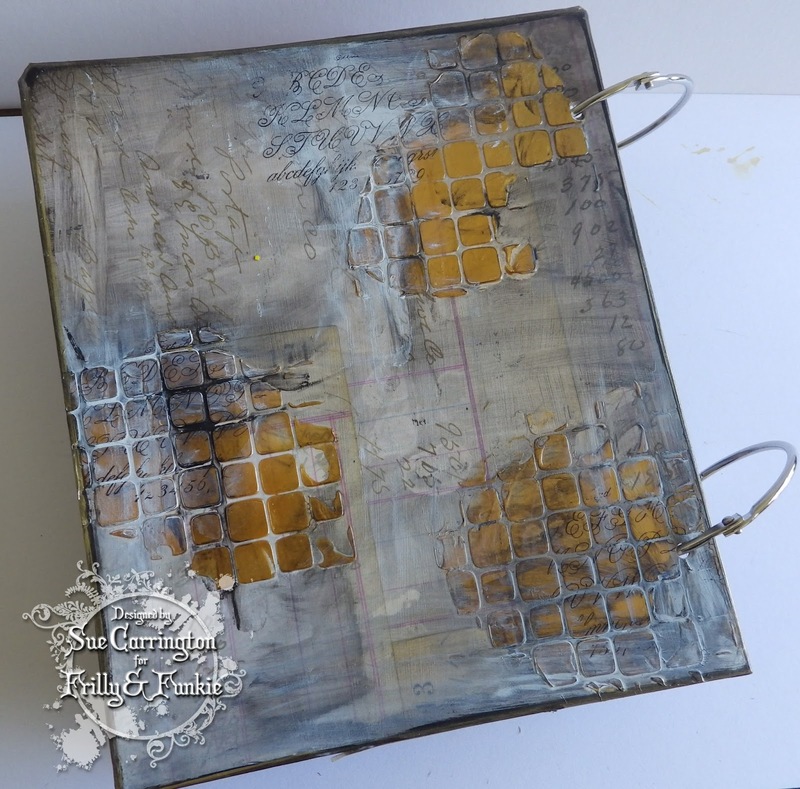 Your stamping and embossing are perfection. And those layered elements really grab me. This is gorgeous! I love your work and became a follower. Fabulous TH-style covers to store your TH stamps - love, love, love!